These aren't your backyard swimming holes. The strangest pools in the world will take you for a swim by the terraced gardens of Bali, in blood-red water in Turkey or in a 3000-foot monstrosity built on the Chilean coast. The Intercontinental Hotel in Hong Kong has lavish amenities and the skyline to back it up. And the cherry on top is a set of three pools that sit atop its third-floor spa deck, overlooking Victoria Harbor. With the three pools set to different temperatures—cold, warm and hot—visitors can choose the water that's just right as they enjoy the closeup view of the Hong Kong skyline. Blue Lagoon is one of the most famous spots on an island known for its gorgeous and mystical geothermal features. The pool is fed by superheated water vented from the ground near a lava flow, and the lagoon is renewed every two days by a nearby geothermal plant through a combination of natural and artificial filtering. Water is heated naturally beneath the earth's surface and takes in minerals on its way to the lagoon. The water, which stays at about 100 degrees Fahrenheit, is rich in minerals like silica and sulphur, and some people claim it has healing powers for skin diseases like psoriasis. The Golden Nugget casino's pool may take top honors as the scariest of the strange pools; it gives you the feeling of swimming with the sharks, without actually swimming next to them. The pool wraps around a giant tank for marine life that cost nearly $30 million to complete, and includes a three-story waterslide that runs through the middle of the tank. Don't worry: There's clear glass between you and the sharks. Jutting out into the Indian Ocean from a tiny island in the Maldives, this luxurious pool belonging to the Conrad Maldives Resort and Spa is in the class known an "infinity pools," which are designed to dissolve the edges of the pool and make you feel like you're floating atop the ocean itself. When the Umaid Bhawan Palace of Northern India was finished in 1943, it was the largest private residence in the world with 347 rooms in all. Later, part of the palace was commissioned into a lavish hotel where guests can live like royalty. For those guests, the palace offers access to the underground Zodiac Pool. The pool, housed deep beneath the palace itself, is covered in gold tiles with the twelve signs of the Zodiac painted on the pool bottom, giving an eerie vibe to an otherwise serene experience. Singapore's SkyPark at the Marina Bay Sands offers an infinity pool with a first-class view—55 stories up. Perched atop the three towers of the world's most expensive hotel, the water seamlessly flows over the edge, into a catchment and back into the pool. The pool itself touches all three buildings and is longer than the Eiffel Tower laid on its side. Infinity pools are designed to create an optical illusion, and the pool at the Hotel Villa Mahal in Turkey might be the best of all. It makes you think that the water is flowing over the edge and into the sky. Atop Victoria Falls in southern Africa, one of the largest waterfalls in the world, is one of the scariest pools in the world. In the natural formation called Devil's Pool, swimmers can look over the falls in relative safety as thousands of gallons of water from the Zambezi River plunge 128 meters into the gorge. At the edge of the pool there is a rock wall that prevents the river from pulling swimmers over the edge. But jumping in is still a harrowing experience for first-time visitors, who can't see the protective wall from the shore. The Library resort on the famous Koh Samui beach in Thailand is packed with dramatic scenery, but the blood-red pool stands out the most. The blood-red effect isn't from dyeing the water, so there's no risk of turning red after taking a dip. The color comes from the combination of red, yellow and orange tiles from which the pool is made. The white terraces inside these pools are enough to take the first-time visitor's breath away. The bright white calcium and limestone deposits act like shelves buried in the water. Much like the Blue Lagoon in Iceland, the pools are praised for their healing powers because of the abundance of minerals in the water. The egregiously luxurious 15 x 30-foot pool, located in the Chelsea neighborhood of Manhattan, is built into the living room of an apartment. The apartment, owned by Evelyn McMurray Van-Zeller, also has six bedrooms, five fireplaces, five bathrooms, a gym, sauna and a second pool for her turtles. This fantasy world is currently on the market, so the pool and other amenities could be yours for just a shade under $11 million. It's not exactly a pool, but it's too crazy to leave off the list. 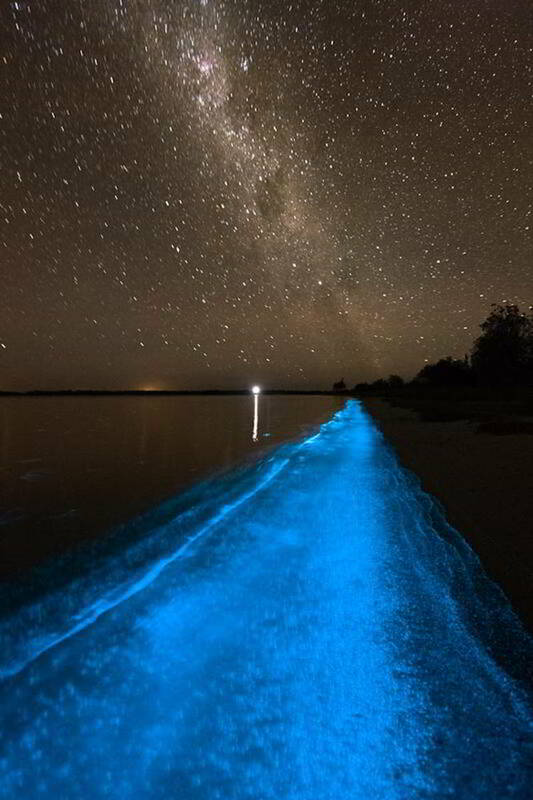 Bioluminescent Bay in Puerto Rico is the kind of phenomenon that could freak out any first-time visitor: When they swim in the bay, a trail of blue light follows swimmers wherever they go. It's not magic, but the abundance of single-cell organisms (as many as 720,000 per gallon of water) that give off this glowing color when they're agitated. Badeschiff in German means "bathing ship," but this ship is actually a shipping container. The Badeschiff opened in 2004 to give Berlin's citizens a sanitary swimming environment near the Spree River, which is much too polluted to take a dip in. The Badeschiff stays open until midnight, and when the sun goes down, the operators deploy a cover over the pool to keep swimmers warm.